How I wish I could be with you on this important day of the opening of your museum. I know how much work, devotion and time you have put into this project and your museum is the result of a dream you had many, many years ago. I am extremely touched by the great honour you have paid me in making the museum and I am looking forward to seeing it myself in the spring when the weather is warmer. As you know I have just come out of hospital and the doctor will not let me travel just now. I would like to thank you and all your family, your husband, your children and everyone whose help and enthusiasm have made this museum possible. The voice of Laura reading out this message from Niki rang out across the exhibition hall. 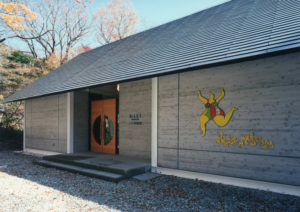 October 6, 1994 saw the opening of the Niki Museum, the only museum in the world crowned with the name “Niki” that exclusively exhibited her works. It was located in the beautiful town of Nasu, Tochigi Prefecture. Looking up, Yoko could see that the coloring of autumn leaves had begun on Mt. Chausu-dake. Soon the leaves in the museum garden would turn red. The day of opening dawned fair and sunny. The personnel in the industry and invited guests came in droves early. A bus shuttled visitors between the Nasu-Shiobara Station and the museum. Although Niki herself could not attend the event due to her recuperation at home, the event was a success thanks to Yoko’s broad social network. Hordes of people in Japan’s art circles attended the ceremony; they included Kiyoshi Makita, the Director of the Ikeda Museum of 20th Century Art, Ito, Shizuoka Prefecture, the media, friends and acquaintances of Yoko. Dozens of painters whom Yoko had made friends with at Space Niki also showed up. On the Niki side, there were Niki’s son Philip, daughter Laura and her husband Laurent, granddaughter Bloum and her husband Bouba, great-grandson Djamal, and staff members Rico and Janice. “You’ve made a splendid art museum, Mrs. Masuda,” Makita congratulated Yoko. She happily returned the smile. Other friends, acquaintances and painters also showered her with words of praise: “I can feel the breathing of an artist named Niki de Saint Phalle,” and “The museum covers Niki’s art thoroughly from the early days to the present.” Many also commented on the “effective contrast between the buildings and Niki’s works.” Yoko kept a beaming smile all day; she showed no sign of lack of sleep. Yoko had been in a whirlwind of activities until the opening. She was pressed to the limit for time especially at the last minute, preparing the invitation cards, notifying the media, and handling the interviews. On the eve of opening, the entire staff, both on the Niki side and the Japanese side, worked in full force to display Niki’s works. It was nearly dawn when Yoko finally went to bed after a heated discussion on where to place nearly 200 pieces of art in order to accurately convey Niki’s spirit. At this frantic pace, the museum was launched and then opened to the general public. There was little time for Yoko to take a breath. Still, while she was swamped with work, Niki’s angry face occasionally came to her mind. There had been no reply from Niki since Yoko informed her of the decision not to modify the ceiling. According to Rico, Niki’s anger had not subsided at all. On the other hand, once the opening date was decided, Niki spared no effort to support Yoko. She loaned her works for one full year with no charge, and sent her main staffers such as Rico and Janice to Nasu to install the art. Niki and Yoko just avoided the subject of the ceiling. It was unfortunate that Niki could not show up for opening, but understandable considering her health. Yoko braced herself once again for the work ahead. One morning, several months into the opening, an old gentleman stood at the entrance to the museum. “Is this an antique gallery?” he asked. “No, sir. This is an art museum exhibiting works of a female sculptor. 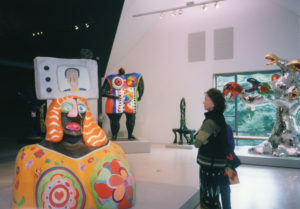 Her name is Niki de Saint Phalle,” Yoko explained with a big smile. It was no wonder he had mistaken it for an antique gallery. There was an old traditional Japanese-style gate, nagaya-mon (a gate incorporating rooms such as a servant room and a stable) at the entrance to the premises. It was said that the former landowner had transferred it to Nasu from Nagano Prefecture. Like this gentleman, initially, many of the visitors were clueless about the museum; they had neither heard the name Niki nor seen her work. A middle-aged man just left after listening to the explanation at the Information Desk. One came in, looked around, became angry and left. A husband killed time by drinking tea in the lounge while his wife appreciated Niki’s work. Those days, many found Niki’s work too radical and provocative. She led him through the long glass-lined corridor from the entrance. Running underneath was a small stream. At the end of the corridor, one of Yoko’s favorites, Thoeris, commonly called “Black Goddess,” welcomed them. “Please go around to the end of it. What animal do you think it is? You’ll get the answer in the last room. Have fun,” Yoko said. The gentleman went behind the piece, looking bemused. A number of colorful electric bulbs were blinking from top to bottom. Next, a series of exhibition halls awaited them. The first one, painted in pink, displayed Niki and Yoko’s illustrated letters. There were also a panoramic photograph and posters of the Tarot Garden. Pointing to artwork piece by piece, Yoko introduced Niki’s activity to the gentleman. She stopped in front of Love Letter to My Lover, the first Niki piece Yoko had encountered. “When I saw this print, I felt I must create a museum for her.” The gentleman said, “Oh, really,” nodding repeatedly. The museum maquette was also on display. The ceiling grew abruptly high in the next exhibition hall. Four large exhibition halls were diagonally connected. The first hall focused on early works of hers, Shooting Paintings. Next, they could see colorful Nanas, jumping, dancing and standing on their heads. In stark contrast to the previous violent works, those bright-colored figures looked free of all care, which seemed to surprise the gentleman. Installed in the vast space were Big Head, just a head sculpture, TV on the Brain and The Big Serpent Tree, all colorful and eccentric. Smaller works formerly displayed at Space Niki were exhibited in a glass showcase. Niki’s prints were there as well. Yoko explained them one by one. The last exhibition hall was a dark, dim space; there, three big majestic golden sculptures, Thoeris, Anubis and Horus were shining brightly. “Fascinating! I didn’t know there’s such a unique artist. I’ll bring my wife, son and daughter the next time,” said the old gentleman. In this manner, Yoko guided around every visitor in the museum as far as time permitted. Little by little, visitors to the museum grew in number. They included women’s organizations, art students, and local branches of the Japan Agricultural Cooperatives. One college student came because he had picked Niki for graduation thesis. Some tourists to Nasu without prior knowledge of Niki ran into her work and enjoyed it; the number of such visitors grew. Niki, today, many elementary pupils visited the museum. They came to create paper mâché after Niki sculptures. First of all, they looked around your works. I heard some children in the hall shouting each other, “Oh dear! Is this the art? So I can make the art works. I am the artist,” or “I could make the works better than these.” Their faces looked so animated. They came back to the lounge and had fun making their own works. I was quite moved. The way to make children close to the art should be to make them feel with deep emotion as if they might be artists. Their teachers or mothers often say to them, “You must not paint or work clay like this or that. It’s no good, (or) bad.” The word of “no good or bad” is a most bad word for children’s spirit. They accept the idea unwillingly under pressure that they are far away to paint or work clay typically as the adult suggests. Gradually they come to believe it is out of the play world of their vivid imagination, feeling or emotion and the art world seems to be something different and fixed to which they can never arouse any emotion nor take part in. Dear Niki, I myself was such a child. Now I am so happy that I’ll make a fresh start in life to be together with children. Around this time, Niki’s works began to appear in the textbooks of elementary and junior high schools in Japan; many were from the Niki Museum. Yoko had been conducting surveys from the inception of the museum. These are excerpts from over 10,000 questionnaire answers. Men’s answers, which used to be negative in the beginning, have changed. Yoko read the questionnaire answers every day, and realized that the response from visitors had been solid and strong. It was 1996, two years into the museum’s opening. “I’m impressed with your museum reports, Yoko. You are very competent. However, you don’t have to send me your report every day. I can’t read them every day. It’s better you send it every three months,” Niki wrote to Yoko. Now, Yoko spent more time in Nasu than in Tokyo. Her Nasu life was quite simple. In Tokyo, she had to deal with various tasks and keep company with many people. In Nasu, Yoko only had to give her full attention to Niki’s works. Here, she may make new discoveries about Niki or talk with visitors. Her life was fulfilling and rewarding. The same year, the Niki Museum building won the Prize for Excellence in the Tokyo Architectural Prize Competition. Yoko at long last completed the manuscript for her review on Niki, My Nana Monster for the catalogue of Niki Museum, and sent it to Niki. Soon she received a letter from Niki. Have I told you how I do love your text, Yoko? The last sentence was extraordinary. That was very funny and gave me a new insight into my works. I’m not so insightful about my own work by nature. Although I’ve heard people talked about my works, no one could talk like you. Bravo! You must write more. Later on Niki asked the publisher of the catalogue raisonne (reasoned catalog), supervised by Niki herself and published in Switzerland, to carry Yoko’s review. Consequently, it appeared along with that by Pierre Restany, a noted art critic and poet. It was an extreme honor for Yoko. Both Yoko and Niki were greatly pleased by them. There was a loud crying voice. Yoko was in tears, clutching the phone receiver. “If you keep talking like that, I won’t stop crying!” Yoko shouted. On the other end of the line was Niki. Although Niki had been angry, she fell silent after hearing Yoko cry. After sobbing for a while, Yoko said, “Now, I’ll hang up,” and put down the receiver on the cradle. Yoko’s son Masashi rushed out of the next room. Those days, he had been helping her manage the museum while doing photography. Yoko turned her face to him. She looked refreshed. Since the Niki Museum had been launched, Niki and Yoko had become all the closer; they shared anything including their families and health issues. Yoko never missed a Niki exhibition as usual. Despite such close relationship, they had always avoided the subject of the acute-angle parts. Lately, though, a small change emerged. Their attitude toward each other became less reserved. Niki never concealed her anger about the ceiling. Yoko found Niki’s behavior obnoxious and expressed it. “Three years have passed already. It’s about time she yielded a little,” was her defense. That day, Yoko and Niki were discussing Niki’s visit to Japan. Sure enough, they ended up touching the ceiling issue. In July of 1997, Yoko and Masashi flew together to San Diego. Niki entered the room. She looked moody, perhaps because she was in ill health. After seeing what the plasterers had been doing, Yoko felt she could not expect an amicable discussion this time again. Their discussion topics eventually reached the problem of ceiling parts. Each tried not to raise her voice; an awkward conversation continued. The mood in the room grew tense, followed by a long silence. Then, all of a sudden, Masashi, who had remained silent, suggested nonchalantly. Hearing that, Niki and Yoko looked at each other and gave a little laugh. Somehow, their equally stubborn hearts loosened, thanks to Masashi’s comment. It could have been that they were waiting for someone to do it. Instantly, their intimacy resumed. The conversation about Niki’s visit to Japan progressed quickly. “I have pollen allergy, what month shall I come?” Niki asked. “October should be fine. Go to Kyoto first, and then to the museum. What do you say?” Yoko said. They kept chatting about the trip as if they had been schoolgirls. When Yoko and Masashi returned home, a hot and muggy summer weather awaited them. Though a little tired, Yoko was in high spirits, thanks to the decision of Niki’s trip to Japan. “Wow! That’s great! You should see it, too. It’s a very unique piece,” Yoko recommended. When she went to San Diego with Masashi, The Red Skull was not completed yet. Niki’s assistant was painting the white skull in red. It was a skull-shaped candlestick designed to hold candles on the head and the ears. It flashed its big silver teeth; the eyes were made of Murano glass. With a built-in computer inside, the blue stars twinkled in the eyes. Moving closer, one may imagine communicating with the dead in the universe. Yoko fell in love with this unique piece at first sight and quickly asked Niki to sell it to her. That night, while sleeping alone in the Nasu lodging, Yoko felt that something was wrong with her body. Her head felt heavy and she could not move as she wanted to. What’s the matter with me? Do I have a cold? But her symptom was getting worse. She struggled her way to the phone and called Masashi in Tokyo. But no matter how hard she tried to speak, she was tongue-tied. She writhed in pain in bed. “Yoko-san? Are you OK?” asked Masashi. Then he jumped into his car and stepped on the gas for Nasu. Yoko was carried to an emergency hospital and diagnosed with a mild case of cerebral thrombosis. The doctor said that it was miraculous she did not have more serious complications. Masashi spoke to the doctor for Yoko, who was paralyzed on the left side and could hardly hold a conversation. “Next December? I’m afraid that’s difficult for her. Please take sufficient rest for a while and start moving your body little by little,” the doctor said. Yoko was greatly disappointed. Niki finally agreed to come to Japan and now this. What a bad timing … She was angry with her paralyzed left side. She couldn’t hold an adequate conversation. She was also concerned about her museum. A letter from Niki arrived. 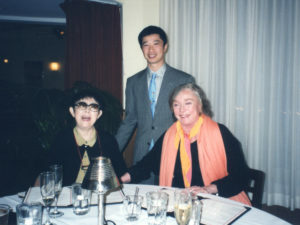 To Yoko’s surprise, she learned that in France Niki had broken her left arm after a fall. Niki had to postpone her visit to Japan since she would be in a cast for three months, the letter said. Yoko replied quickly. I was just amazed… Do you remember the occasion three years ago when I visited you at La Jolla? It was just after I broke my right wrist, and you sprained your right wrist. We exchanged letters written with left hands. This time again (For some mysterious bond between us creating not a happy but an unfortunate coincidence), you can’t move your left arm and I can’t move my left side. Don’t you find it also mysterious that all this happened just after your Red Skull had arrived here? I naturally feel sorry that your visit to Japan was postponed, but it seems that some higher existence is probably telling us to set the date of your visit a little later than originally planned. Niki’s visit was postponed to October, 1998. In May of 1998, The Tarot Garden, a sculpture garden that Niki had devoted herself for twenty years was finally completed and opened to the public. Yoko, though not being able to attend its opening ceremony due to recuperation, heartily celebrated the completion of a palace of her dreams. What wonderful perseverance! Yoko once again was struck with a sense of awe and respect toward Niki. She also thanked her good luck to be able to keep close company with this rare and extraordinary person. An October day, 1998, was the day Niki was to arrive in Japan; Yoko was fulfilling a cherished dream. Although there was a little numbness in her left side, her life had been back to normal. In the arrival lobby of Kansai International Airport, she was impatiently waiting for Niki. Niki had written to Yoko several days before. I am very excited about coming to visit you, your museum and Japan. It is an important moment for me. AT LAST. I would have loved to have been there for the opening, but now it is happening at this time, and maybe it is better this way as I was not in good health then, and it probably would have been too much, and I could not have appreciated the trip the way I will now. I send you my warmest greetings and love, and I am looking forward to seeing you very shortly. Niki and her company arrived. Niki in a wheelchair looked fatigued. Yoko’s eyes filled with tears. Often-ailing Niki was risking her life on this trip. She granted my request by gathering up her strength. Yoko was quite moved. Yoko rushed to Niki in the wheelchair. Niki smiled at Yoko. She was accompanied by her daughter Laura, granddaughter Bloum, great-grandson Dawn, nurse Rita and interpreter Yuko. Yoko was with her son Masashi and his family, and Tsuneji Ohnogi, a Kyoto resident and acquaintance of hers who would be the guide for Niki. The whole group headed for Kyoto without delay. After Niki took plenty of rest, and then on her request, they visited Sanjusangen-Do Hall, a national treasure temple. They went into the cool, dark main hall. The 1,000 statues of Senju Kannon (Goddess of Mercy of a Thousand Arms), which must have glowed brightly when they were originally created, were standing in serenity as if they were trees in the woods. Niki gazed at them, lost for words. Next, they visited the Kinkaku-ji (Golden Pavilion) and Ginkaku-ji (Silver Pavilion) temples and enjoyed tofu cuisine at the Nanzen-ji temple for lunch. Niki walked around happily on the shiny black stage at the Kiyomizu-dera temple. A refreshing autumn breeze was blowing there. Niki fit naturally into the Japanese landscape. The fourth day into Niki’s visit, the Kyoto Women’s Association hosted “An Evening with Niki de Saint Phalle: Film and Talk” in cooperation with the Niki Museum at Wings Kyoto Event Hall. Despite the rain, the hall was filled to capacity with four hundred visitors. After the screening of Daddy produced by Niki, Niki and Yoko talked on stage with sociologist Chizuko Ueno as the emcee. Niki had been feeling sick and seemed not healthy enough to do the show. However, once on stage, she started talking so passionately that her interpreter found it difficult to interrupt. Yoko, sitting beside her and nodding at her speech, gently told her to let the interpreter speak. Perhaps the audience found their relationship heartwarming; they frequently gave them a warm hand. She concluded her remarks with the message for the Japanese women. Yoko had planned to introduce Niki’s works with many slides in the talk show. But the event staff advised her, “There’s little time. Just ten slides, please.” Still, Yoko managed to explain 100 slides in her characteristic manner. The audience loved her humorous talk. Though the event went overtime, the audience was greatly excited and gave Niki and Yoko a big hand at the closing. That night, Niki came down with a fever from fatigue and could not attend the welcoming party at “Tinguely” on Karasuma-dori Street. This café & gallery was named after Niki’s late partner Jean Tinguely and displayed his works. Tinguely himself had visited it to create works (now closed). Thus, Niki was very disappointed that she couldn’t make it. “I’m sorry to disturb you, Masashi,” Niki said. That was the third time she used that phrase that day. Masashi, bending down, was tying the strings of her boots. In Japan, especially in Kyoto, tourists have to remove their shoes wherever they go. Niki had a hard time doing it herself. So, Masashi and other men had offered Niki their “boots” duty. Niki was overjoyed to see little souvenir shops, crammed with small articles. She showed keen interest in all those goods. Yoko said to her, “I will buy you seals as a present to commemorate the completion of The Tarot Garden.” In an old seal shop, Niki picked up and examined the merchandise piece by piece. Yoko ordered seals of kanji characters related to tarot cards including tsuki (moon), hoshi, (star) and taiyo (sun) in addition to kotobuki (congratulations for a long life) and shu (excellence). Later, Yoko sent Niki the finished seals, which made her very happy. Niki used those seals in letters. Niki’s final day in Kyoto was lively. She lounged in yukata kimono; served in front of her was the Kyoto-style cuisine on ozen (four-legged tray). Top-class geishas performed for Niki at a long-established Japanese-style inn. Yoko had arranged it so that Niki could experience at least one stay at a traditional inn. Niki was happy and excited. Whether yukata or the Japanese-style bath, everything was a first-time experience for Niki. In particular, her face lit up when she watched her first geisha performance. That night Niki uncharacteristically had a good appetite, but she could eat only a limited portion due to her allergy and dietary restrictions. Niki seemed to be completely satisfied with her stay in Kyoto. Yoko felt relieved for the time being. However, she was still anxious about Niki’s trip to Nasu. What will Niki say when she sees the ceiling for herself? Won’t she get angry all over again? Yoko’s heart sunk with anxiety. Oblivious to Yoko’s feelings, Niki and the rest of the group boarded the Shinkansen bullet train with a happy smile. Niki kisses Yoko in front of the Niki Museum. In Nasu, the party got out of the car in front of the nagaya-mon gate, the entrance to the museum. Niki and Yoko both began to speak less and less. 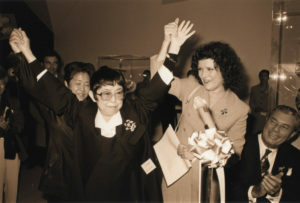 Yoko supported Niki, holding her arm, and led her toward the museum building. Or it could look more like Niki was supporting Yoko. Everybody was walking on the slope in the cozy garden with a happy expression, except Yoko. At the end of the slope around the pond was the main entrance. They gave a shout of delight when they saw the dancing Nana logo on the wall by the entrance. It was designed by Niki. Pointing to it, Niki whispered a few words into Yoko’s ear. Then, Niki straightened her back, regained her breath, and stepped into the building. Niki looked over the lounge from the front desk, held Yoko’s arm once again, walked toward the end of the corridor to see black Thoeris. Next, in the hall painted in pink, she gazed at her own illustrated letters. She went on to observe the hall for shooting paintings, the hall with dancing Nanas, and the hall with larger works such as Big Head and The Big Serpent Tree. She was very thorough, not missing any piece. After seeing the Egyptian god statues in the final hall, Niki turned back to look over all the exhibition halls. Her cheeks were slightly blushed. Yoko was feeling too anxious to turn her eyes away from Niki’s profile. She was nervous under extreme tension, “Niki may be on the verge of getting angry …” She felt like her heart would burst. Just then, Niki embraced Yoko. She said in a soft, yet very firm voice. Tears welled up in Niki’s eyes. Too touched to speak, Yoko could do nothing but give a few nods. She felt tears overflowing, too. That was the moment the ill feeling between the two dissipated. At this point, the acute angles of the ceiling didn’t matter anymore to Niki. After seeing the whole exhibition, Niki understood what Yoko’s museum signified. 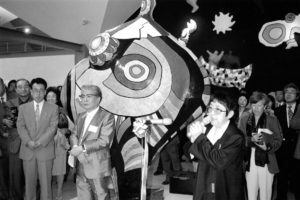 Yoko had collected Nanas, Egyptian god statues and other works as her life’s work, and those works with their appeal and charm had been naturally housed in the museum space — that proved what this art museum was all about to Niki. Yoko felt that after all those years, they had finally and completely understood with one another. Memories flooded into Yoko’s mind one by one; sharing their dreams in the Tarot Garden, and exchanging their letters regarding the founding of the museum. Although I faced difficulties so many times, I’m truly glad I didn’t give up. Yoko was overwhelmed with emotion. The next day, a welcoming event was held in Niki’s honor. A great many people came, longing for the sight of Niki. Many chochin lanterns written “Niki Museum” in black ink were lit. At the entrance, the staff made rice cake in the shape of Nana. Sushi and croquettes were sold at stalls. Niki was fascinated by the Japanese-style candy maker who sculpted an emerald green dragon in an instant. Yoko had planned them all in order to entertain Niki. 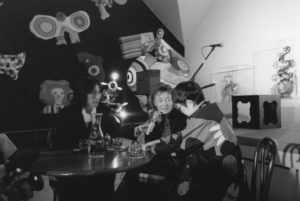 At night, a talk show was held, featuring Niki and Yoko. They sat side by side on a makeshift stage in one of the exhibition halls. The large audience was looking intently at them. Yoko stood up to greet them. Niki moved forward to kiss Yoko on the cheek. Niki began to talk next to Yoko who was speechless. All Yoko could do was to nod beside Niki. Tears continued to flow from her eyes. The two women gripped each other’s hands firmly. The audience responded with a long, warm applause. Upon returning to San Diego, Niki had a severe case of viral pneumonia. She became bedridden for a long time. After more than one month, she sent Yoko a letter. I still feel very weak and am up today. Let me tell you how magical the trip and discovery of Japan and your museum was to me. An inspiring trip which will remain in my heart always. Also your marvelous hospitality and that of Masashi was extraordinary. While lying in my bed sick so many images of the trip kept reappearing in my head. In memory and homage to you and your museum during the following year I will make a Buddha statue as a gift for your museum. While I was sick and unable to read I would sometimes think about the incredible evening when Daddy was shown and you, Laura, Bloum and me were all crying. It was memorable! Your husband who sat next to Laura was highly amused and was smiling! None of us will ever forget this evening! Your museum totally enchanted me, also your husband’s architecture, which marries so well with my work. Meanwhile, Yoko was also sick in bed from exhaustion. She was still recalling the time she and Niki were crying and hugging with each other in the museum. Niki came all the way to Japan. When Niki saw the entire structure, she spontaneously understood how the acute-angle parts fit into the ceiling. Contrary to her physical fatigue, Yoko was quite content and happy beyond description. Reading Niki’s letter in bed, Yoko was delighted to know that she would create a work inspired by Japanese elements. Not only that, it would be a gift to Yoko and Yoko’s museum. What would Niki’s Buddha be like? Quickly, Yoko threw aside the quilt and got out of bed. She rushed to a bookshop and selected dozens of photograph books on Buddha statues to send Niki. 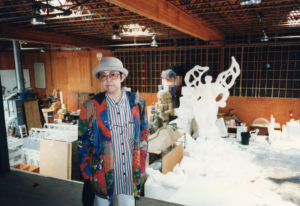 In 1999, Yoko and Masashi revisited Niki’s studio in San Diego to see her Buddha sculpture in progress. It was practically a thank-you visit for Niki’s Japanese trip. Niki opened the door to the artwork warehouse. A gigantic white model emerged; it was 10-feet high, 6-feet wide and shaped like a Buddha. “Wow! How big this is!” Yoko looked up, amazed. Once again, Yoko was struck with admiration for Niki’s ever-challenging, ever-evolving attitude. At age 68, she was still trying new materials. The previous year, Niki had published her autobiography TRACES. In addition, she had just begun to work on a large-scale project in an Escondido park in southern California. And now she’s making Buddha sculptures. Yoko, who had seen the sickly Niki during the Japan trip, could not hide her astonishment at Niki’s insatiable motivation. Where does this overflowing energy come from? In the end, Niki’s attitude never ceased to inspire Yoko. In 2000, Buddha at last arrived at the Niki Museum. The sculpture, now with the tiles, glass, mirrors, and pebbles, looked all the more profound. Its coloring was even more radical and vivid than that of Niki’s previous works. It had a big hole in the back big enough to contain a little child. Yoko wondered if it was for meditation. 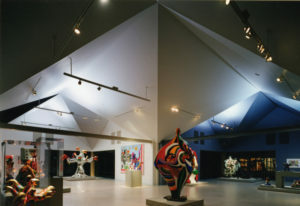 Since the sculpture was too big for the existing halls, Yoko hastily added an extra exhibition hall. One noticed an immediate change of atmosphere in the Buddha exhibition hall. The statue exerted so much energy and overwhelmed the viewer with cosmic themes. When gazing at the eye in the middle of its face, Yoko felt like her soul was going to be sucked into it. “When Niki created this Buddha, she was influenced by the Japanese culture. That alone has a special meaning. This work will definitely be my signature piece in my collection.” Yoko was firmly convinced of that. Yoko, Masashi and Niki in San Diego. In July of 2000, the laureates of “The 12th Praemium Imperiale Prize in Honor of the Late Prince Takamatsu” were announced at the Tate Modern in London. This prize is an international arts prize awarded annually by the Japan Art Association to distinguished artists for their excellence in the five fields of Painting, Sculpture, Architecture, Music, and Theater/Film. The prize is known to be a rare award from Japan that is respected worldwide. 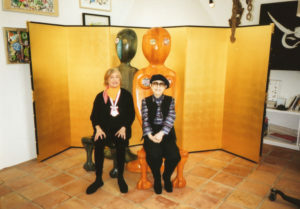 This time Niki was awarded the prize for Sculpture. The award ceremony was scheduled for October at the Meiji Kinenkan hall in Tokyo. Niki and Yoko both rejoiced at the news. Niki contacted Yoko, asking, “I’d definitely like you to attend the ceremony with me.” Yoko also wished to see Niki on the grand occasion. However, looking back on Niki’s trip to Japan, and how frail she had looked, Yoko’s heart ached. Yoko wasted no time to write Niki a letter. When you were in Japan several years ago, you looked as if you were traveling at the risk of your life. My heart was filled with sadness and I couldn’t stop crying. I’m sure it was physically painful for you to fly to Japan, and you exhausted yourself. Knowing you, you’ll never admit your weaknesses. But I’d like to share this Japanese proverb, “After turning 60, it is alright to neglect social obligations, make a fool of yourself, and be selfish.” This is the iron law for survival. I beg you not to overstrain yourself. Yes, it is true I was very afraid to come because of my health and having to fly. I wondered if I would survive such a journey. Tremendous pressure was put on me to come and I felt badly to refuse. Your letter was a breath of fresh spring air flown from heaven because I was so afraid to disappoint you by not coming. In the end, Niki canceled the trip to Japan and had her daughter Laura attend the ceremony. In San Diego, Niki did an interview on the award, which was shown at the ceremony. After the ceremony, Yoko, Tsuji and their two sons were invited to the banquet. In December, Yoko and Masashi flew to San Diego. They had commissioned a noted craftsman to make a golden folding screen. They presented this splendid 6-feet-by-13-feet screen to congratulate Niki on her win. Masashi took a picture of them. It turned out to be the last photograph showing Niki and Yoko together. Yoko was awakened by a midnight call. She had an uneasy feeling. “Hello?” Yoko spoke into the receiver. This was the initial news Yoko received from a friend of Niki’s in France. On May 21, 2002, Niki’s life came to an end at the age of 71 in San Diego. As an artist, she lived a life full of ups and downs. Yoko paced around her bed. I have to tell Tsuji and Masashi about Niki’s death. What are Laura and Bloum doing now? Yes, I’m going to write letters to them all. Yoko rummaged through the drawer of her desk and pulled out a writing pad. But she could do nothing. I can’t believe Niki’s dead. I bet she will write to me in a short while, “Dear Yoko, I’ve been terribly ill for a while, but now I’m OK. How are you?” Yoko stayed wide awake all night, sitting on her bed. She was petrified. According to Niki’s will, a Native American medicine man, one of Niki’s acquaintances, prayed for her and Laura scattered the ashes into the sea off San Diego. It was very appropriate for her ending; she had loved nature, the earth, life and human beings more than anything else. On June 28th, a memorial ceremony for Niki de Saint Phalle was held at the Church of Saint-Merri near the Pompidou Center, Paris. Yoko and Masashi were present. There were nearly one thousand attendees including French ministers, celebrities and Niki’s fellow artists and friends from all over the world. Ailagon, France’s Minister of Culture, read a eulogy, while the ex-king of Greece on behalf of her friends praised Niki’s achievements. Other notable attendees included Jean-Gabriel Mitterrand from the JGM Gallerie (an acquaintance of Yoko and a nephew of the former President Mitterrand), Pontus Hulten (the first director of the Pompidou Center) and Pierre Restany, a good sympathizer of Yoko. Yoko and Masashi were seated next to Laura and Bloum. After the ceremony, people began to gather around the Stravinsky Fountain that had been created jointly by Niki and Tinguely in front of the Pompidou Center. Niki’s relatives threw a flower bouquet into it. The sky was clear blue with no clouds in sight in stark contrast to the deep sorrow of the mourners. As Yoko approached Restany in the crowd, he recognized her at once. They silently embraced each other and cried. He had visited the Niki Museum twice. He once said, “I sense some spirituality from your museum. You’re like a medium for Niki, I think.” Now, no word could express their deep sense of loss. Yoko went back to Japan, and resumed working despite her profound sorrow. In the pink room in the closed museum, she reread Niki’s illustrated letters one by one. Each letter conveyed Niki’s living words. I’ll never receive Niki’s letters again… Why did you die, Niki? I had lots and lots to talk about with you. Yoko began to cry. She then wept out loud. She walked through the exhibition halls. There were memories in every piece of Niki’s art. Yoko remembered them very clearly. Once, when she visited Niki’s studio, she saw dozens of fascinating works and felt like taking all of them. When she said so to Niki, she replied, “It’s impossible to own my entire artwork, Yoko,” in half laughter, half disgust. In any event, Yoko’s mind for the last two decades was dominated by nothing but Niki, Niki, Niki. Those words, which Niki had bestowed on Yoko, came back to her. Although Niki’s gone, her wishes will live on. Yoko felt while gazing at Niki’s works in the exhibition halls. Thanks to Niki and her artwork, Yoko was able to believe in herself, thinking, “I will live my life as myself,” and “I will affirm myself at all times.” Your works helped me return to the little girl — that naked girl, that curious and reckless girl who was not afraid of failure. Your works gave me the courage to live as a human being along with dreams and pride. Just as I was able to change, I want many people to receive the same power that I got from your artwork. I’ll continue to introduce your world to the public. I’ll give courage and power to many others. And that’s the proof of our friendship. Niki, thank you for everything. You have done so much for me. With Niki sitting in the middle, joined by Yoko, Bloum and Masashi, a lively dinner began. Then, Niki said. “I was frustrated with you because I couldn’t talk to you in a candid, honest manner. That’s why I sang with an attitude, ‘Because you’ve been mean to me, I’ve been mean to you, too,’” said Yoko. “I was so amazed. It was a spot-on impersonation of Peggy Lee.” The laughter flooded the room. Yoko said, “Maybe. But as I’ve told you before, in our previous life, you were a witch and I was the judge who sent you to the stake. That’s why I had to make your museum; it was my atonement in this life. So, in the afterlife, it’s your turn to render services to me.” Yoko was having fun.